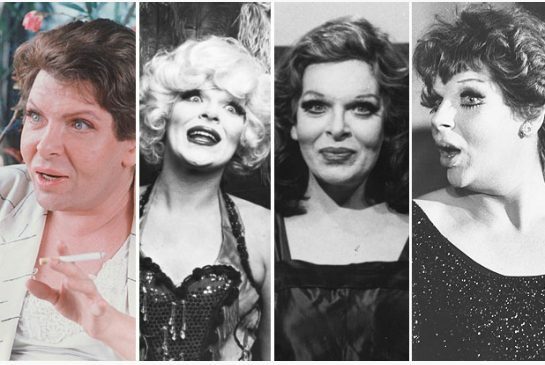 The Canadian female impersonator and actor CRAIG RUSSELL was born on this date in Port Perry, Ontario. Russell became president of Mae West’s fan club as a teenager, and briefly worked and lived in Los Angeles as her secretary. He returned to Toronto where he moved in with the writer Margaret Gibson. He worked as a hairdresser while pursuing his career as a stage entertainer. By 1971, he was a regular performer in Toronto Gay clubs and had a burgeoning international following. He toured Las Vegas, Hollywood, San Francisco, Berlin, London, Paris, Amsterdam, Hamburg and Sydney. While performing, he always spoke and sang in the voices of the celebrities he was impersonating. In 1977, Russell starred in the film Outrageous!, based on a short story written by Gibson about their time as roommates. A decade later, in 1987, he starred in the sequel to Outrageous!, appropriately titled Too Outrageous!